This digital collection is comprised of State of Montana enlistment cards for the Montana National Guard from 1890 to 1918 and from 1939 to 1945, arranged alphabetically by surname. It includes enlistment information for everyone who entered the service in Montana during this period. Below are directions for finding women in the military enlistment records, including nurses and World War II service women. Under All Collections, drag the vertical gray scrollbar down until you see Military Enlistments (Montana), World War I (or World War II, depending on which records you want). Click the blue Browse the Complete Collection link. Once you open the collection, you will see several options. Women are grouped separately from the rest of the registrations, making it easier to search for them. For World War I, there is a collection called World War I Nurses at the bottom of the list (link here). World War II Women (ABLQUIST-NELSON) (link here). World War II Women (NESS-ZIMMERMAN) (link here). The cards are arranged alphabetically by surname. You can search by surname using the navigation bar to the right, which has surnames listed in ranges. For example, if you want to search for Smith in the World War II collection, you would click the + sign by Savage-Stafford and click through the pages to find the person you are searching for. Using Page Flip View helps navigate pages faster. The button is located in the middle of the screen above the images, in a light gray and blue box. You can also search for a particular name using the Text Search option at the top left of the page. This will bring you directly to the page with results you are looking for. Note: Please keep in mind that, while the best effort has been made to ensure that all text on all cards is searchable, some cards have defects that hamper text searching. If you do not find the person you are looking for, try browsing using the alphabetical ranges. You can find enlistment records such as Doris Palm Brander’s (pictured here). Brander played an instrumental role in gathering the enlistment records of her fellow service women. Without her commitment to honoring their service, the records may have been lost or destroyed. Read more about Brander by clicking here! 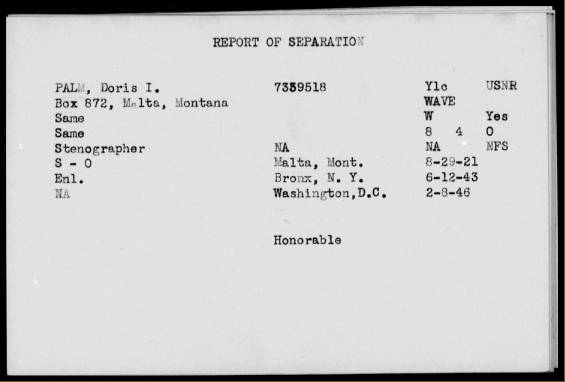 Doris Palm “Report of Separation,” from the Military Enlistments (Montana), World War II Collection at the Montana Memory Project. Click for full resolution.